Electronics-Salon Screw Terminal Block Breakout Module, for Arduino MEGA-2560 R3. 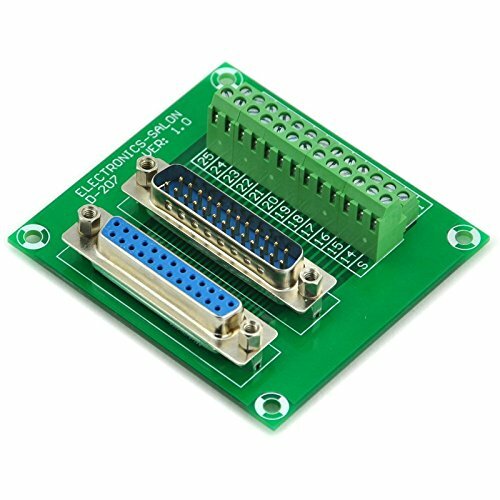 Electronics-Salon DB37 D-SUB DIN Rail Mount Interface Module, Male / Female, DSUB Breakout Board. 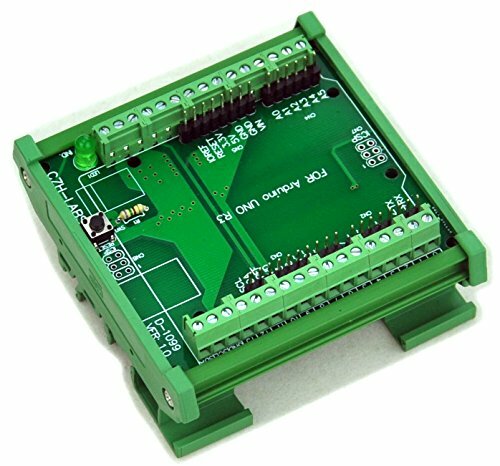 Electronics-Salon DIN Rail Mount Screw Terminal Block Adapter Module, For Arduino UNO R3. 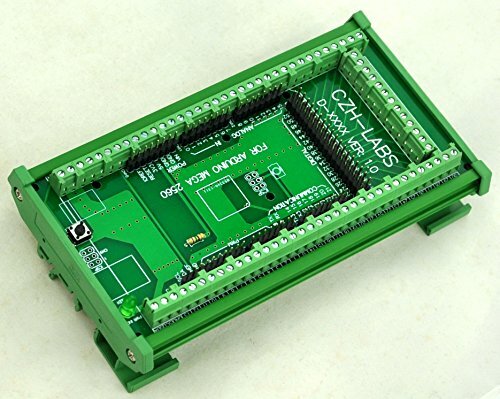 Electronics-Salon IDC-40 DIN Rail Mounted Interface Module, Breakout Board, Terminal Block. 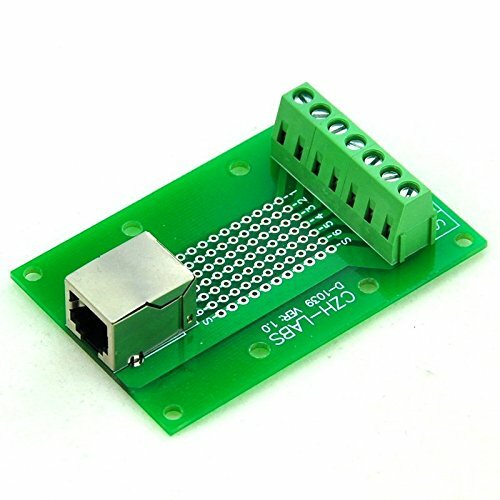 Pi Terminal Block Breakout Module - for Raspberry Pi. The item has been soldered and assembled, with mounting screws, standoffs and labels. Terminal block pitch 3.5mm/0.138", wire size range 26AWG to 16AWG, strip length 5mm, screw M2 steel, pin header and cage copper. FR-4 fiber glass PCB, dual copper layers, pads grid pitch 2.54mm/0.1", hole diameter 0.8mm. NOTE: the item not include Raspberry Pi. Terminal block pitch 3.5mm/0.138, wire size range 26AWG to 16AWG, strip length 5mm, screw M2 steel, pin header and cage copper. FR-4 fiber glass PCB, dual copper layers, pads grid pitch 2.54mm/0.1, hole diameter 0.8mm. 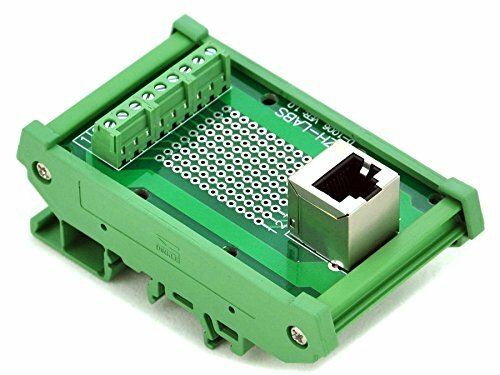 Electronics-Salon DIN Rail Mount Screw Terminal Block Adapter Module, for Raspberry Pi 1 Model A+,1 B+, 2 B, 3 B, 3 B+, 3 A+, ZERO, ZERO W.
DIN Rail Mount Screw Terminal Block Adapter Module. 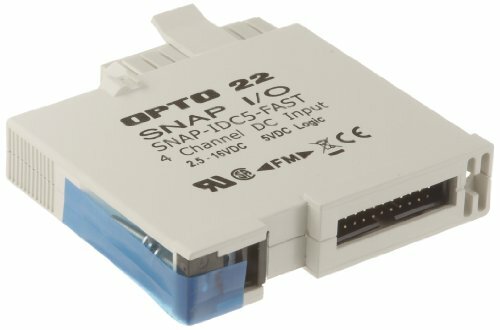 With the adapter module you can easily extend Raspberry-Pi projects to industrial control applications. 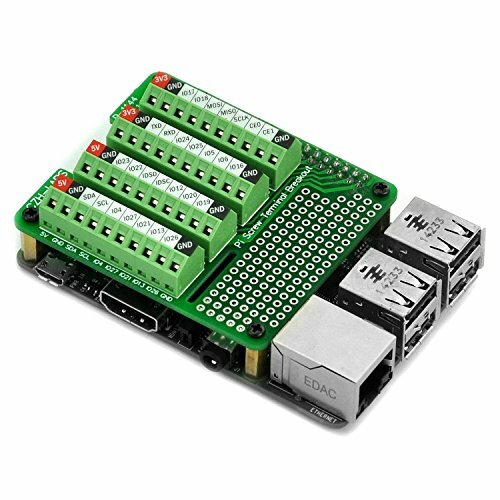 Applications for Raspberry Pi 1 Model A+, Pi 1 Model B+, Pi 2 Model B, Pi 3 Model B, Pi 3 Model B+, Pi 3 Model A+, Pi Zero and Pi Zero W. (Now upgraded to Version 1.1, to add support Pi Zero and Pi Zero W. But, you must soldered a 2x20pins male header in your Raspberry Pi ZERO). CN3 and CN4 1:1 on board connected. 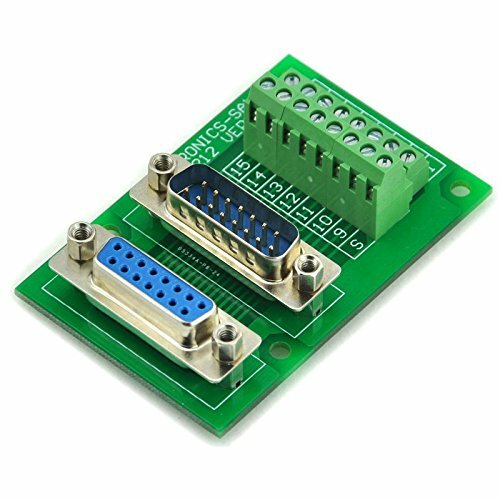 CN3 connect Raspberry Pi board. CN4 Extension connector, you can use a FRC 40-pins wire connect to other devices. Pitch 3.81mm/0.15" high quality screw terminal block, wire range 26-16AWG, strip length 5mm, Metric M2 slotted screw. FR-4 fiber glass PCB, dual copper layers. Module Dimensions: L 102mm x W 87mm x H 45.5mm, PCB Dimensions: L 100mm x W 72.5mm. Note: the item not include Raspberry-Pi module. 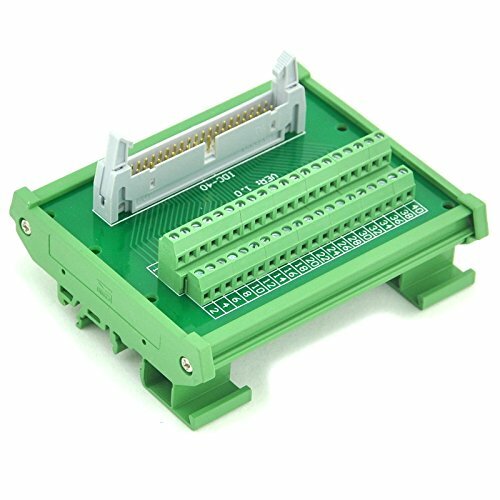 DIN Rail Mount Screw Terminal Block Adapter Module. 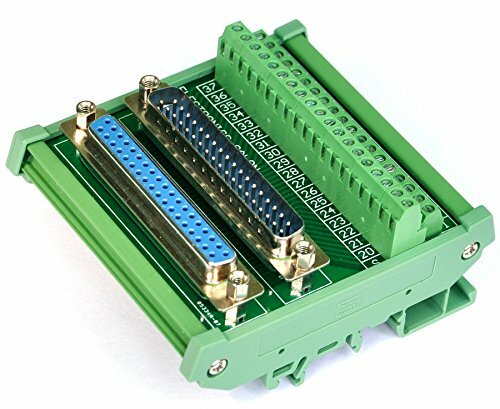 With the adapter module you can easily extend Raspberry-Pi projects to industrial control applications. Applications for Raspberry Pi 1 Model A+, Pi 1 Model B+, Pi 2 Model B, Pi 3 Model B, Pi 3 Model B+, Pi 3 Model A+, Pi Zero and Pi Zero W. (Now upgraded to Version 1.1, to add support Pi Zero and Pi Zero W. But, you must soldered a 2x20pins male header in your Raspberry Pi ZERO). Pitch 3.81mm/0.15 high quality screw terminal block, wire range 26-16AWG, strip length 5mm, Metric M2 slotted screw. FR-4 fiber glass PCB, dual copper layers. Terminal Block Breakout Module - for Arduino MEGA-2560 R3. the item has been soldered and assembled. 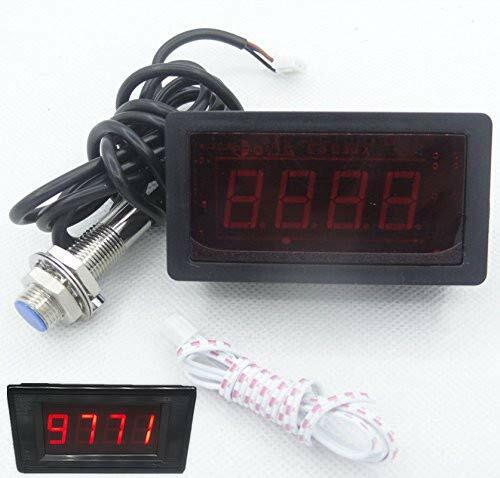 With power on LED indicating. red reset button on the side. with a ICSP adapter connect header. PCB: FR-4 fiber glass PCB, dual copper layers, size 120mm x 78mm. Pads grid / pitch 2.54mm / 0.1", hole diameter 0.8mm. Terminal block pitch 3.5mm / 0.138", hole diameter 1.2mm. Terminal Block: Pitch 3.5mm / 0.138 mini terminal blocks, total 84 pins(3pole x24pcs, 2pole x6pcs ). Wire range 26~16AWG, strip length 5mm, screws M2 steel, pin header and cage brass. Female Header Socket: Pitch 0.1/2.54mm, pin length 15mm / 0.59 Single row 10pin x1pcs, singal row 8pin x 5pcs, dual row 18pin x1pcs. Din Rail Mount DB37 Interface Module. Male and Female DB37 connectors. Screw terminal block. Din rail mountable - for width 35 / 32 / 15mm rails. High quality PCB carrier. FR-4 fiber glass PCB. External dimensions: 87 x 80 x 43mm(W x L x H). PCB dimensions: 72 x 77.35mm(W x L). 100% new, never used. Terminal block specifications: Pitch - 3.81mm. Rated voltage - 150V. Rated current - 10A. Wire range - 26-16AWG. Strip length - 5mm. Screws - M2,steel,Cr3+ Zn plated. Torque - 0.2Nm (1.7Lb-In.). Pin header and Cage - Brass. Din Rail Mount DB37 Interface Module. Male and Female DB37 connectors. Screw terminal block. Din rail mountable - for width 35 / 32 / 15mm rails. High quality PCB carrier. FR-4 fiber glass PCB. External dimensions: 87 x 80 x 43mm(W x L x H). PCB dimensions: 72 x 77.35mm(W x L). 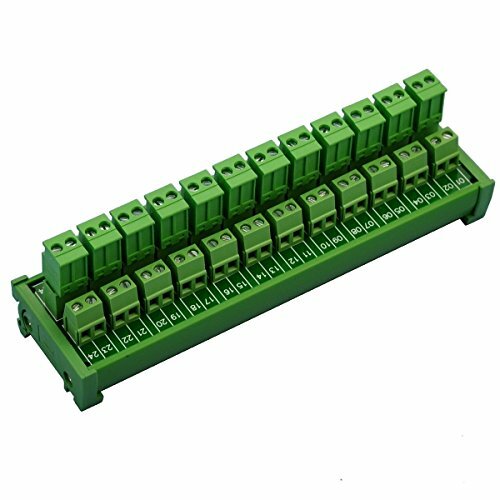 DIN Rail Mount Pluggable 12x2 Position 10A / 300V Screw Terminal Block Distribution Module. Input terminal: Screw terminal block, pitch 5.0mm/0.197", strip length 7mm, screws - M2.5, steel, Cr3+ Zn plated. pin header and cage - brass. Output terminal: Pluggable screw terminal block, side wire connect, pitch 5.08mm/0.2", strip length 7mm, screws - M2.5, steel, Cr3+ Zn plated. pin header and cage - brass. Wire range 28AWG ~ 12AWG / 2.5mm square. Rated voltage 300V, rated current 10Amp(per position). High quality Taiwan DINKLE fireproof nylon material DIN rail mount carrier (not China low quality carrier), can support width 35mm rail. Input terminal: Screw terminal block, pitch 5.0mm/0.197, strip length 7mm, screws - M2.5, steel, Cr3+ Zn plated. pin header and cage - brass. Output terminal: Pluggable screw terminal block, side wire connect, pitch 5.08mm/0.2, strip length 7mm, screws - M2.5, steel, Cr3+ Zn plated. pin header and cage - brass. DIN Rail Mount Screw Terminal Block Adapter Module, For Arduino UNO R3. PCB Dimensions: 80mm x 72.5mm(W x L). Module Dimensions: 83mm x 87mm x 45mm (W x L x H). Note: the item not include Arduino-UNO module and iron rail. Terminal Block Breakout Module - for Arduino UNO R3. the item has been soldered and assembled. Standard IDC40 pitch 0.1" header, you can use 40pin FRC(flat ribbon cable) connector cable connect all Arduino Uno pins to peripheral equipment. With power on LED indicating. red reset button on the side. with a ICSP adapter connect header. FR-4 fiber glass PCB, dual copper layers. 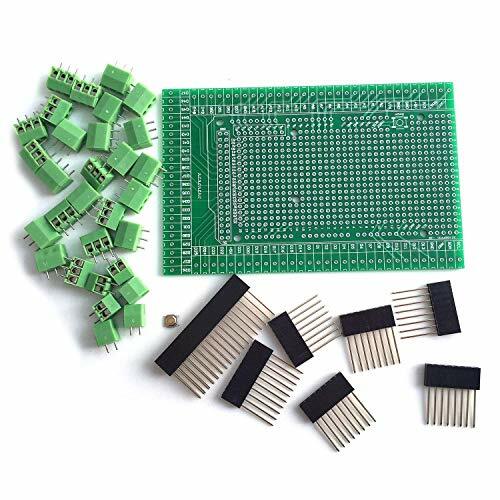 Standard IDC40 pitch 0.1 header, you can use 40pin FRC(flat ribbon cable) connector cable connect all Arduino Uno pins to peripheral equipment. IDC-40 DIN Rail Mounted Interface Module. IDC pin pitch 2.54mm/0.1" male header connector. Pitch 3.81mm/0.15" screw terminal block. Din rail mountable - for width 35 / 32 / 15mm rails. Din mount case can be taken apart for panel mount use. High quality PCB housing/carrier. FR-4 fiber glass PCB, dual copper layers. External dimensions: 87 x 103 x 54mm(W x L x H). PCB dimensions: 72 x 100mm(W x L). 100% new, never used. Rated voltage: 60V. Rated current: 1A / per pin. Operating Temperature: -20 C to 50 C Terminal block specifications: Wire range - 26-16AWG. Strip length - 5mm. Screws - M2,steel,Cr3+ Zn plated. Torque - 0.2Nm (1.7Lb-In.). Pin header and Cage - Brass. IDC-40 DIN Rail Mounted Interface Module. IDC pin pitch 2.54mm/0.1 male header connector. Pitch 3.81mm/0.15 screw terminal block. PCB dimensions: 72 x 100mm(W x L). 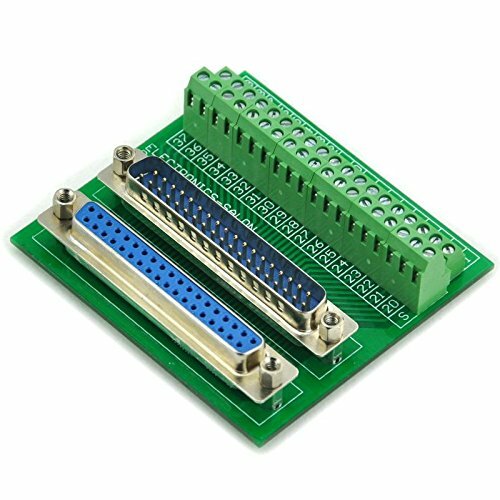 Electronics-Salon RJ11/RJ12 6P6C Right Angle Jack Breakout Board, Terminal Block Connector. RJ11/RJ12 6P6C Jack Breakout Board. Right Angle Shielded 6P6C jack. Pitch 5mm/0.197 screw terminal block. Solder connection holes 11 per line, supports addition of 0.1 pin headers. FR-4 fiber glass PCB, dual copper layers. PCB dimensions: 72.5 x 47.35 x 15mm (W x L x H). 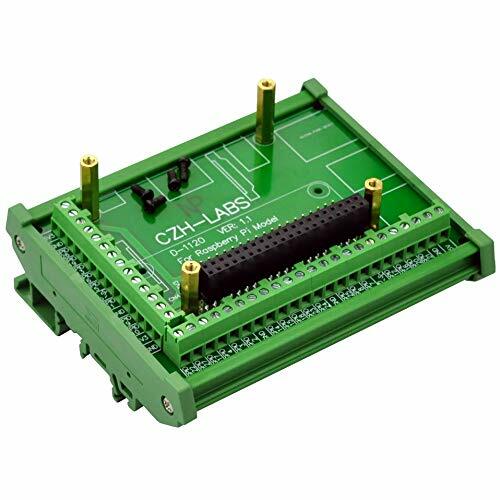 D-SUB DB25 Male / Female Header Breakout Board. DB25 male and female header connectors. Pitch 3.81mm/0.15" screw terminal block. FR-4 fiber glass PCB, dual copper layers. Dimensions: 72 x 77.35 x 20mm(W x L x H). 100% new, never used. Rated voltage: 60V. Rated current: 1A / per pin. Operating Temperature: -20 C to 50 C Terminal block specifications: Wire range - 26-16AWG. Strip length - 5mm. Screws - M2,steel,Cr3+ Zn plated. Torque - 0.2Nm (1.7Lb-In.). Pin header and Cage - Brass. 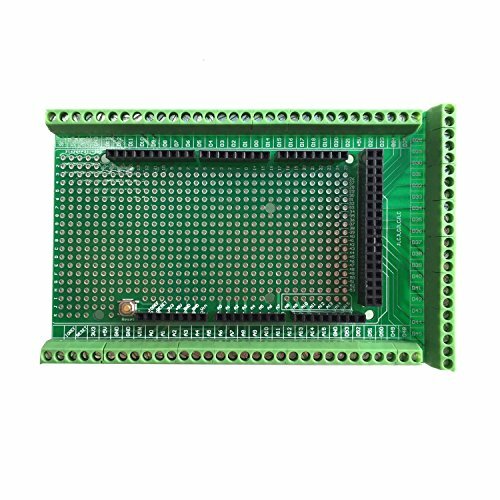 D-SUB DB25 Male / Female Header Breakout Board. DB25 male and female header connectors. Dimensions: 72 x 77.35 x 20mm(W x L x H). D-SUB DB9 Male / Female Header Breakout Board. DB9 male and female header connectors. Pitch 3.81mm/0.15" screw terminal block. FR-4 fiber glass PCB, dual copper layers. Dimensions: 72 x 47.35 x 20mm(W x L x H). 100% new, never used. Rated voltage: 60V. Rated current: 1A / per pin. Operating Temperature: -20 C to 50 C Terminal block specifications: Wire range - 26-16AWG. Strip length - 5mm. Screws - M2,steel,Cr3+ Zn plated. Torque - 0.2Nm (1.7Lb-In.). Pin header and Cage - Brass. D-SUB DB9 Male / Female Header Breakout Board. DB9 male and female header connectors. Dimensions: 72 x 47.35 x 20mm(W x L x H). 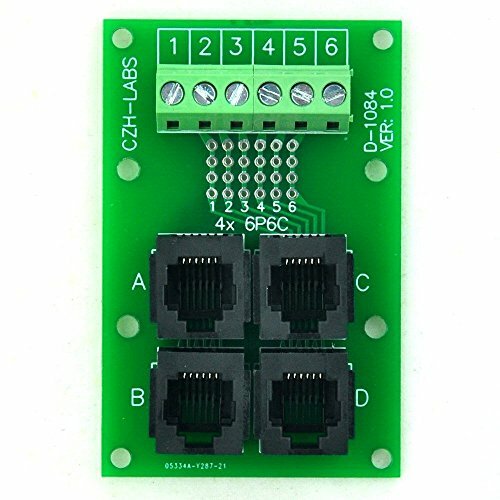 Electronics-Salon RJ11/RJ12 6P6C Jack 4-Way Buss Breakout Board, Terminal Block, Connector. RJ11/RJ12 6P6C 4-Way Buss Breakout Board. Pitch 5mm/0.197" screw terminal block. Solder connection holes, four (4) per line, supports addition of 0.1" pin headers. PCB dimensions: 72.5 x 47.35 x 16mm(W x L x H). Rated current: 0.5A / per pin. Wire range: 26 ~ 16AWG. Screws: M2, steel, Cr3+ Zn plated. Pin header and Cage: Brass. Vertical 6P6C jacks. Pitch 5mm/0.197 screw terminal block. Solder connection holes, four (4) per line, supports addition of 0.1 pin headers. Electronics-Salon D-SUB DB15 Male / Female Header Breakout Board, DSUB Terminal Block, Connector. D-SUB DB15 Male / Female Header Breakout Board. DB15 male and female header connectors. Pitch 3.81mm/0.15" screw terminal block. FR-4 fiber glass PCB, dual copper layers. Dimensions: 72 x 47.35 x 20mm(W x L x H). 100% new, never used. Rated voltage: 60V. Rated current: 1A / per pin. Operating Temperature: -20 C to 50 C Terminal block specifications: Wire range - 26-16AWG. Strip length - 5mm. Screws - M2,steel,Cr3+ Zn plated. Torque - 0.2Nm (1.7Lb-In.). Pin header and Cage - Brass. D-SUB DB15 Male / Female Header Breakout Board. DB15 male and female header connectors. Electronics-Salon D-SUB DB37 Male / Female Header Breakout Board, DSUB Terminal Block Connector. D-SUB DB37 Male / Female Header Breakout Board. DB37 male and female header connectors. Pitch 3.81mm/0.15" screw terminal block. FR-4 fiber glass PCB, dual copper layers. Dimensions: 72 x 77.35 x 20mm(W x L x H). 100% new, never used. Rated voltage: 60V. Rated current: 1A / per pin. Operating Temperature: -20 C to 50 C Terminal block specifications: Wire range - 26-16AWG. Strip length - 5mm. Screws - M2,steel,Cr3+ Zn plated. Torque - 0.2Nm (1.7Lb-In.). Pin header and Cage - Brass. D-SUB DB37 Male / Female Header Breakout Board. DB37 male and female header connectors. 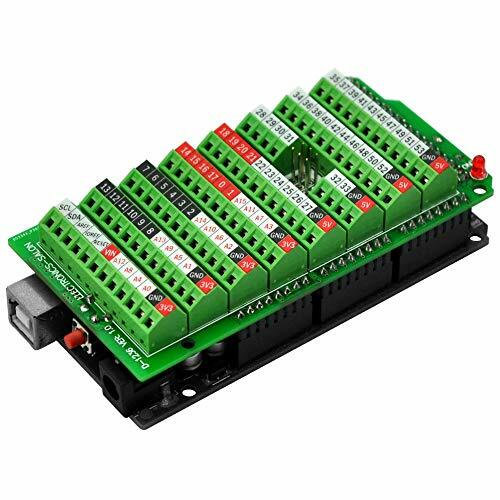 Electronics-Salon RJ45 8P8C DIN Rail Mount Interface Module, Vertical Jack. 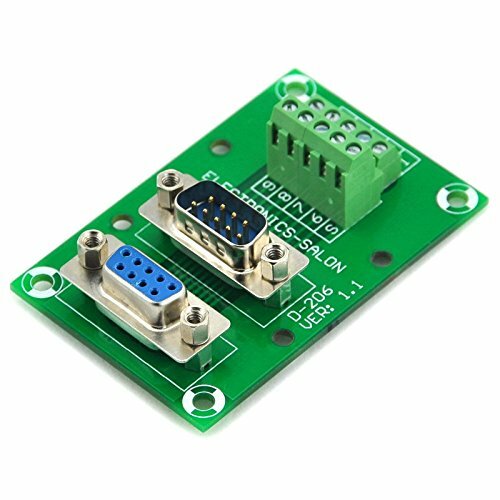 RJ45 8P8C DIN Rail Mount Interface Module. RJ45 vertical shielded 8P8C jack. Pitch 3.81mm/0.15" screw terminal block. DIN rail mountable - for width 35 / 32 / 15mm rails. DIN mount case can be taken apart for panel mount use. High quality PCB housing/carrier. Solder connection holes 12 per line, supports addition of 0.1" pin headers. FR-4 fiber glass PCB, dual copper layers. External dimensions: 72 x 49.5 x 42mm(W x L x H). PCB dimensions: 72 x 47.35mm(W x L). 100% new, never used. Rated voltage: 100V. Rated current: 1A / per pin. Operating Temperature: -20 C to 50 C Terminal block specifications: Wire range: 26 ~ 16AWG. Strip length: 5mm. Screws: M2, steel, Cr3+ Zn plated. Pin header and Cage: Brass. 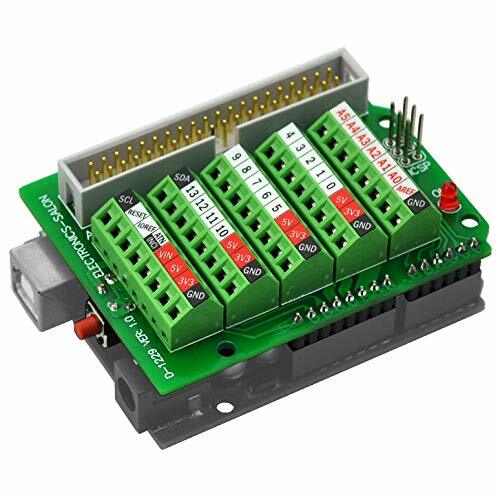 RJ45 8P8C DIN Rail Mount Interface Module. RJ45 vertical shielded 8P8C jack. Pitch 3.81mm/0.15 screw terminal block. DIN rail mountable - for width 35 / 32 / 15mm rails. DIN mount case can be taken apart for panel mount use. High quality PCB housing/carrier. Solder connection holes 12 per line, supports addition of 0.1 pin headers. FR-4 fiber glass PCB, dual copper layers. External dimensions: 72 x 49.5 x 42mm(W x L x H). PCB dimensions: 72 x 47.35mm(W x L).